If you're not sure what to do at any given step, post a question or contact your local Saturn retailer! Oil Filter torque: 18 ft-lb or as tight as possible by hand. 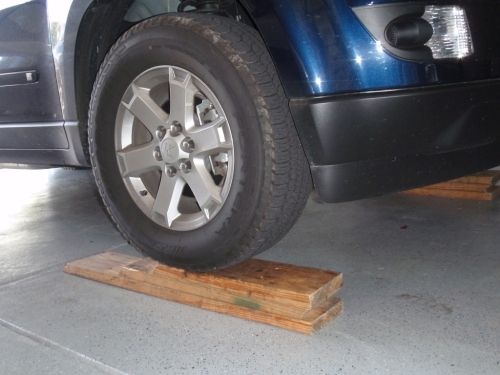 Drive front wheels on suitable ramps. 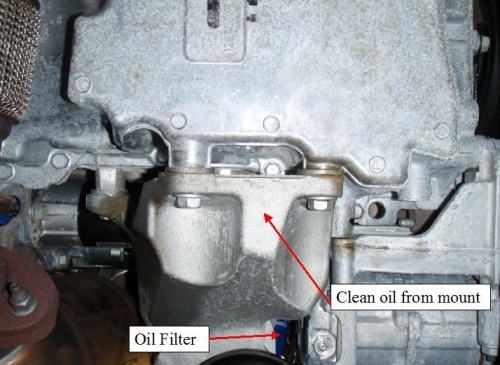 Place pan under the oil pan drain plug and loosen drain plug. 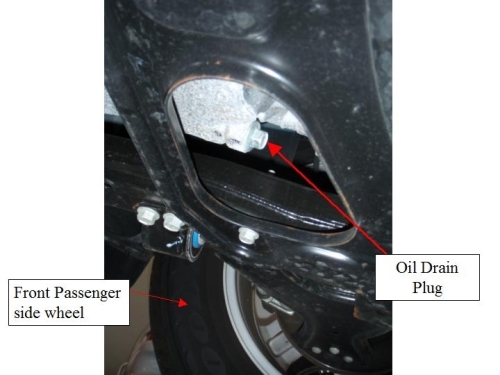 Oil will shoot out approx 1ft rearward of drain plug so make sure to take this into account when positioning the pan. Oil drain plug appears to be self tapping from the factory. Clean off plug threads to ensure there are no aluminum shavings before reinstalling. Once oil has drained from pan, tighten the drain plug to 18 ft-lb (216 in-lb). This is an aluminum pan, so do not overtighten! 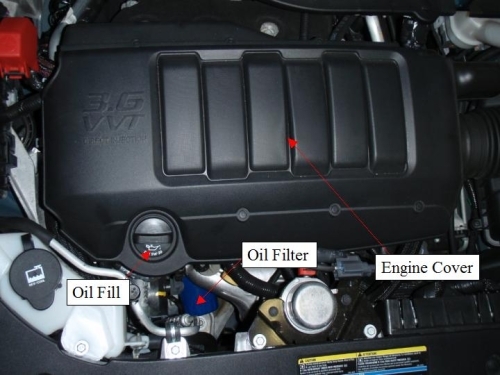 Locate oil filter. Remove oil fill cap and pop off the engine cover (just pull up on it). Replace oil fill cap for now. 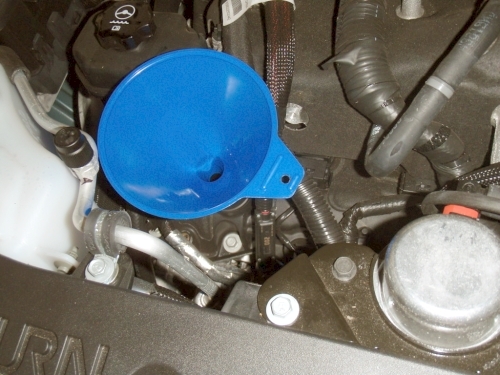 Place oil pan under the filter area, but slightly towards the passenger side. Using a strap type filter wrench (or any filter wrench that you prefer), reach down from the top and remove the filter. Some oil will pour out onto the engine mount. I put shop rags on the rubber portion of the mount to make things easier for cleaning up. 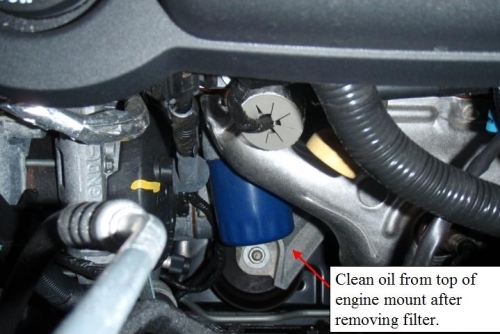 Wipe oil from engine mount (from top and bottom). 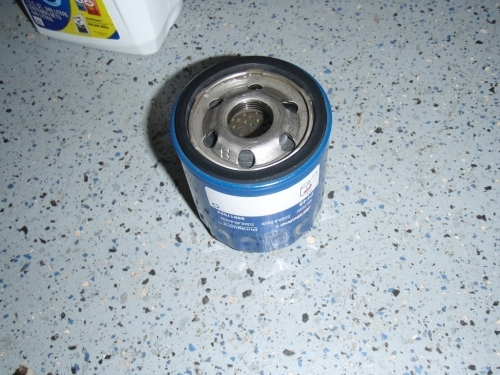 Apply some clean oil to the threads and seal of new oil filter (AC Delco PF-48 or equivalent) and fill approximately 1/3 with oil. I like as much oil in the filter as possible to help prime the system, but you're limited on how much you can put in since the filter is installed at nearly 90 degrees. Hand tighten new oil filter as tightly as possible by hand. Do not use a wrench unless you plan to torque to the spec of 18 ft-lb (216 in-lb). I've always just installed them as tightly as possible by hand and never had an issue. Use a funnel and fill with 5.5 qt of oil TOTAL (5.5qt is total system capacity with filter). Do not overfill. Snap engine cover back in place. Install Oil Fill cap. If you check oil dipstick at this point, it may appear over full since oil filter is empty (until you start engine). You need to start the engine, turn off, then check oil dipstick. Start engine and check for any leaks while it's running. Turn engine off and check oil dipstick. From the Kansas City Business Journal: Union employees at the General Motors Fairfax Assembly Plant issued a letter warning the company that they will strike on Tuesday unless progress is made toward getting a new contract. Jeff Manning, president of United Auto Workers Local 31, said the previous contract expired in September.